Deploy a WordPress site quickly and securely with GridPane. 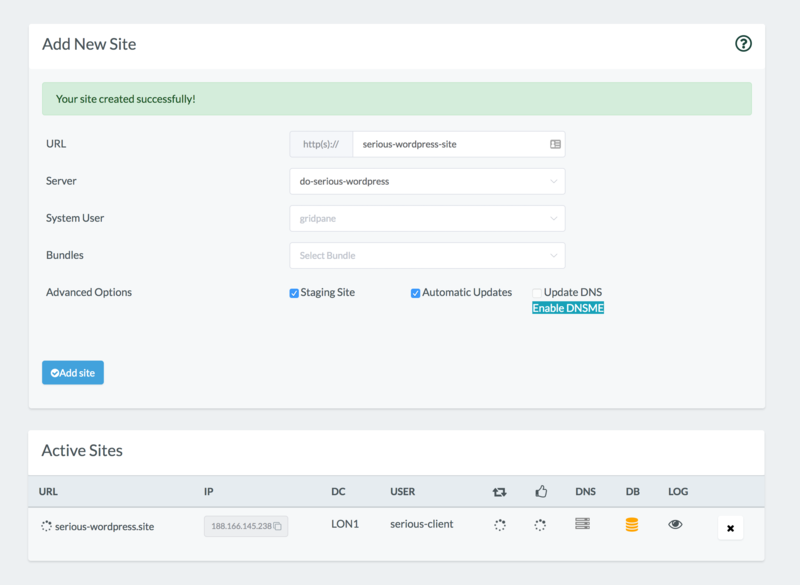 GridPane simplifies the process of deploying a Serious WordPress sites in a much more secure manner than the traditional WordPress 5 Minute Installation. 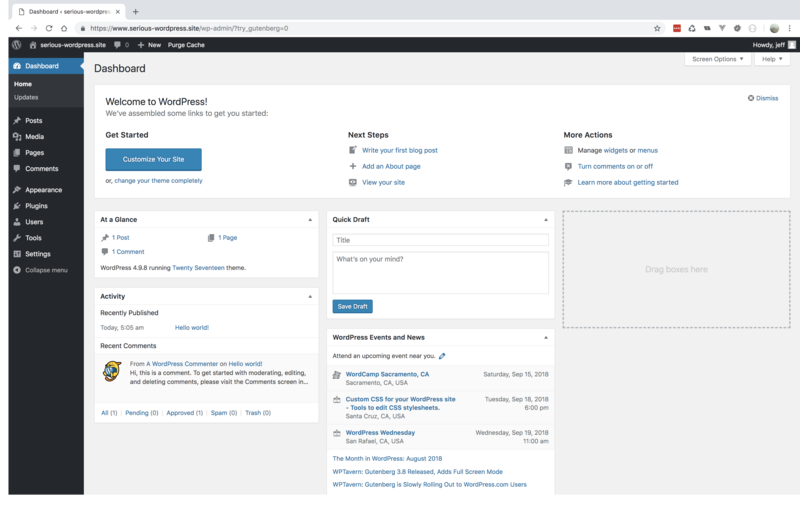 The GridPane automated WordPress deployment creates your database and installs a fully functioning WordPress site with admin user and password all from within the protected environment of your GridPane dashboard. You must configure DNS records for your domain at your domain registrar and DNS provider before you can visit your WordPress site. Since it can take some time (from several hours up to 48 hours) for your DNS changes to fully propagate, it is advised that you configure your DNS records prior to deploying your WordPress site. GridPane features integration with the DNS Made Easy API. If you are a DNS Made Easy Customer you can enable DNSME DNS configuration as you deploy your site. GridPane is currently developing integrations with other DNS provider APIs including CloudFlare. Click on the sites link in the GridPane main menu to begin the process of deploying a Serious WordPress site. At the top of the Sites page you will see the Add New Site panel. First add your domain name in the URL input field. Next, choose the server you wish to deploy to from the Server dropdown selector. We have easy to follow tutorials which provide step by step guides to provisioning server instance from several different infrastructure providers here. After that, you can also choose which system user will own the site from the System User dropdown selector, this defaults to the GridPane user. This is useful if you want to give different users SSH/SFTP access to different sites on the server, and maintain secure sandboxing. We have a separate article that details the steps to add a System User to a GridPane server here. If you wish you may select a GridPane Bundles to use to deploy a site preconfigured with your most commonly used themes and plugins. We have an easy to follow step-by-step guide to using GridPane Bundles here. The Advanced Options section has several preselected checkboxes which will configure a Staging Site and the GridPane Automatic Updates feature. We do not recommend you change these settings. GridPane Staging Sites allow you to push from your live production site to your staging site, or from your staging site to your live production site, at any time. The Automatic Updates use GridPane UpdateSafely™ to utilize an automated visual comparison when updating your site's plugins and themes to ensure site integrity is maintained. If you have added a DNS Made Easy API key in your system settings, you will be given the option to Update DNS. You can click the Enable DNSME to go to the settings panel and add your API key. We have an easy to follow guide that details using DNS Made Easy with GridPane here. Once you have entered the appropriate configuration parameters to suite your needs click Add site to being deploying your Serious WordPress site on GridPane. 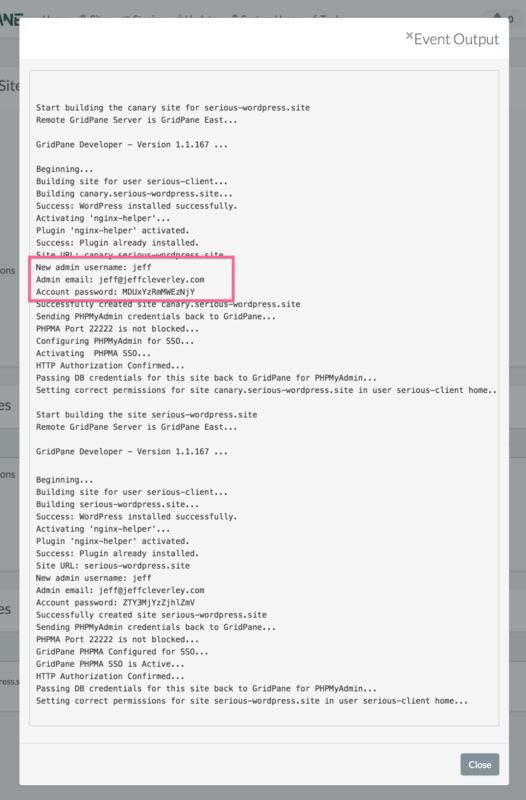 GridPane will immediately begin deploying your Serious WordPress site. You will receive a green success notice banner and your site will now be displayed in the Active Sites list below the Add New Site panel. While the deployment process is still ongoing you will see spinner icons for each of the aspects of the deployments progress and the DB icon will be yellow. Behind the scenes GridPane is creating a database, installing WordPress with an Admin User, creating a staging site and configuring automatic updates and UpdateSafely™, installing the Nginx helper function and configuring Nginx FastCGi caching and Redis Object caching for your site and more. This is not your average WordPress site deployment! Please be patient while GridPane is working it's magic. Once deployment is complete the spinner progress notifications will be replaced by green ticked checkboxes and the DB icon will turn green. 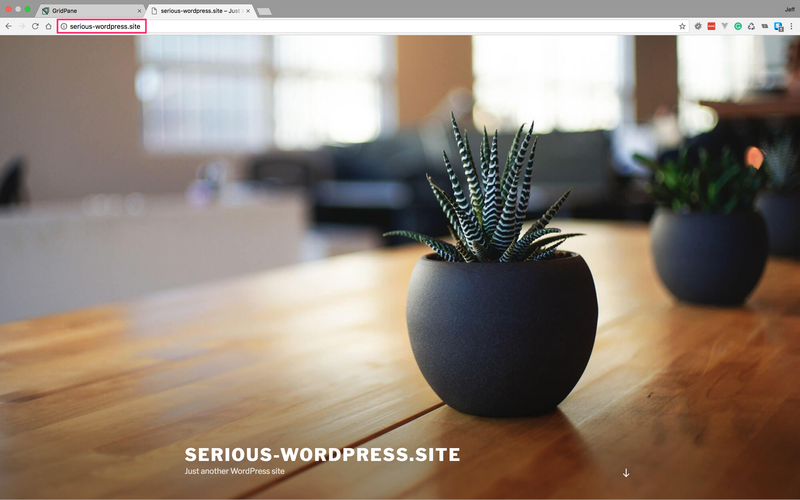 You may now visit your Serious WordPress Site at it's URL. However as you will see, presently the site has no SSL certificate and is currently being served insecurely over HTTP. If you do not require HTTPS access then you are done. However the the internet is moving to a more secure footing and it is not recommended to operate your site without an SSL certificate. We have a separate easy to follow guide to show you how to enable an SSL certificate on your GridPane WordPress site here. Step 6. 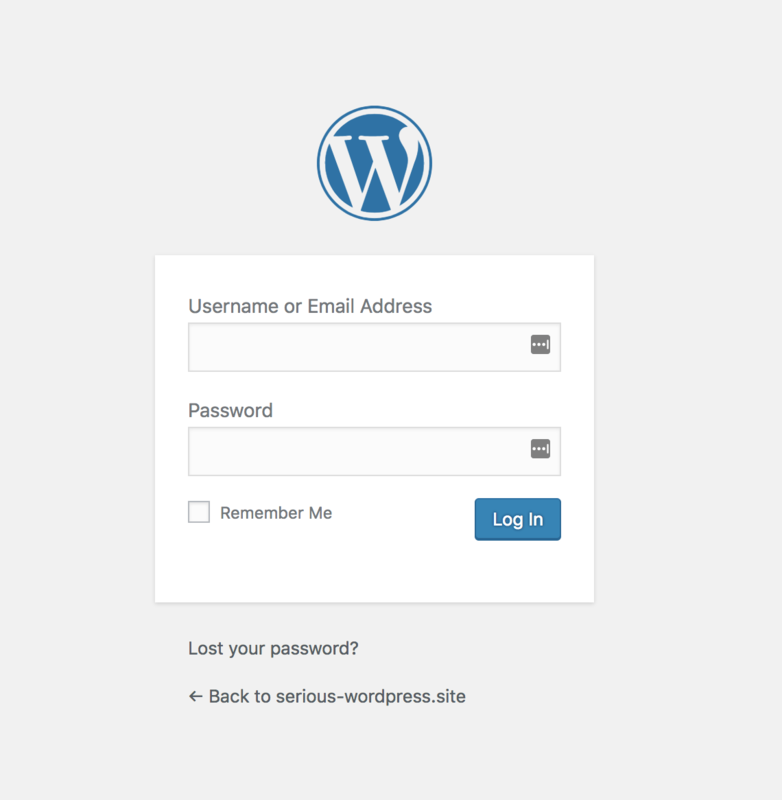 Login to your WordPress site and do great things! Depending on whether you have enabled an SSL or not. You will be redirected to the WordPress login page. You will need to enter either your Admin Username or Email Address and Password. 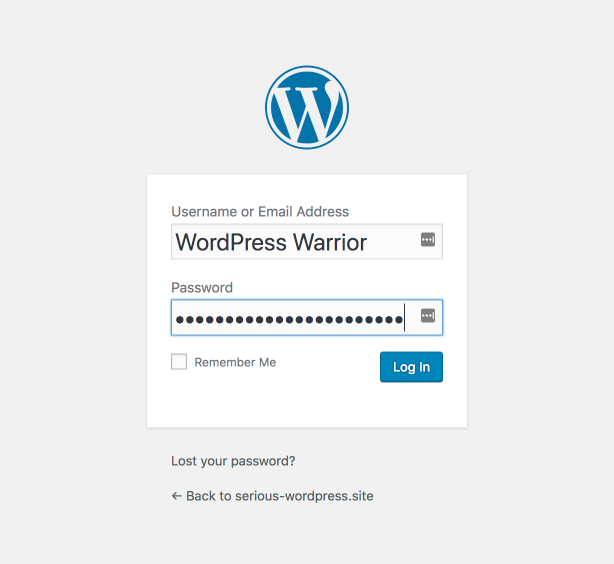 If you have set your Default WordPress Admin Settings, then you will use these credentials to login in. If you are not using a Default WordPress Admin User, then GridPane will have set your Username and Email address using your GridPane account user, and will have generated a strong password. You can find these Admin User login details in your site log. We have an easy to follow guide that shows you how to view your log here. Enter your WP Admin User credentials and click log in. You are now logged in and ready to create WordPress magic!